To view our current inventory of antique skylight and other binnacles, click here! SOLD TO FRANCE FOR USE ON A 1920'S SCHOONER. Thank you! 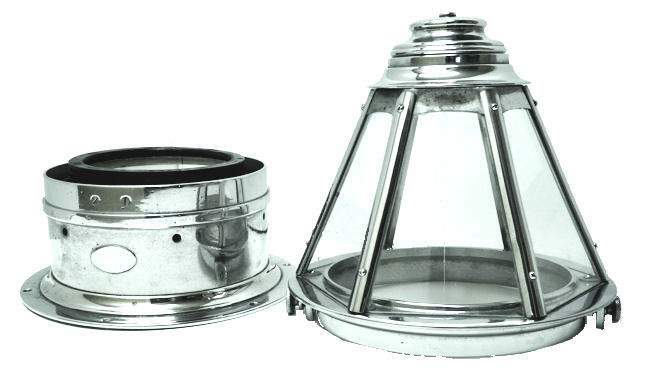 PRESENTED is an early Perko skylight or cathedral binnacle made by Perkins Marine Hardware around 1935 in a very well kept, nickel finish housing. It is fitted with a Ritchie of Boston compass, serial number 81688, which is viewed through any of seven panels. Two of the panels have etched vertical lines whose purpose is for taking bearings. This binnacle was originally sold by the Thomas Laughlin Company, of Portland, ME.which started operations in 1836. This binnacle shows PERKO's high quality. 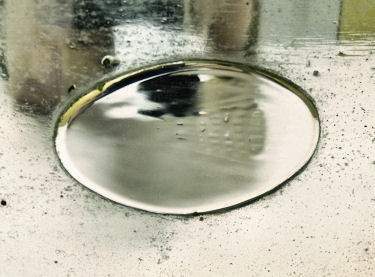 Where other skylight binnacles are made from stamped sheets of brass, the base and most of the structural parts of the PERKO skylight are forged in solid brass. 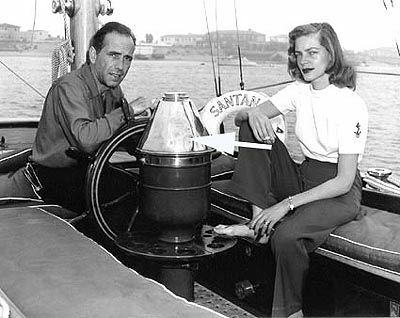 In 1948, Humphrey Bogart and Lauren Bacall stared in a movie called “Key Largo” which was a gangster film set in the Florida keys and featured a motor yacht name “Santana“. Binnacles such as these became very popular starting in the 1920's. Bogie also had one in the cockpit of his well known yawl Santana. It is shown here covered with a chrome hood.Their popularity increased after the movie for those who could afford them because they were considerably more expensive. Years later, in 1979, I insisted on having one on our ketch Bagheera which served us well during seven years of ocean cruising. PERKO discontinued making them about 1954, and Ritchie did the same. The only source was Danforth which stopped their production in 2009 at a price of $3800.00 in chrome. CONDITION: After all these years, the nickel is in excellent condition considering its age and use at sea with only lightly speckled verdigris. It shows some additional weathering in the front, but very little elsewhere. The PERKO name tag has been heavily polished and is almost illegible. There is a loss of paint at the top of the compass card at its pivot. 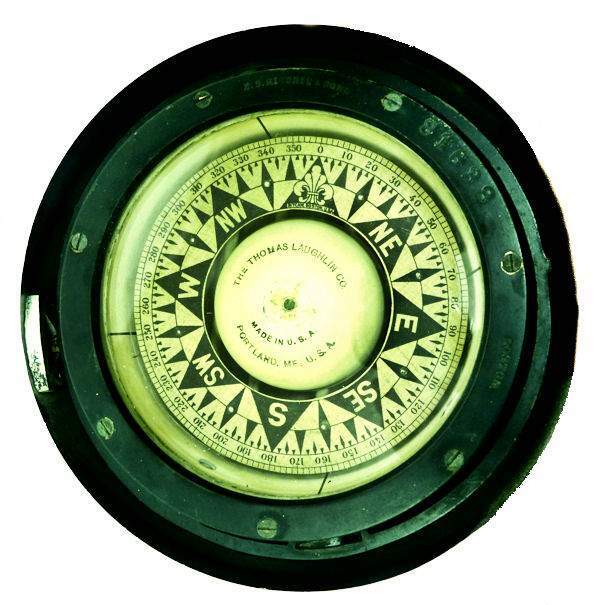 The compass is being sold for display. Its fluid has been removed to preserve the card, and it is not intended to be used at sea in this condition. It can be made ready for sea by simply adding a mixture of 1/3 alcohol and 2/3 distilled water. There is no lighting fitted. There is a 1mm hole at the top in which a bulb and receptacle can be fitted from inside. 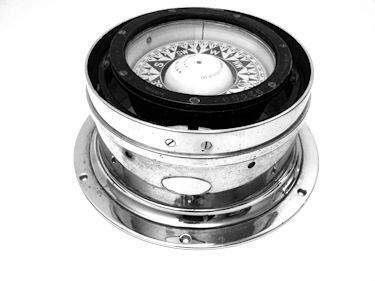 Diameter of compass card 4 1/2" Diameter of compass max 6" & Base 9 3/4"
BRIEF HISTORY OF PERKO INC., Formerly Perko Marine Hardware: Perko's name has been synonymous with marine hardware and lighting fixtures for generations. It is a privately owned, fourth generation family corporation. 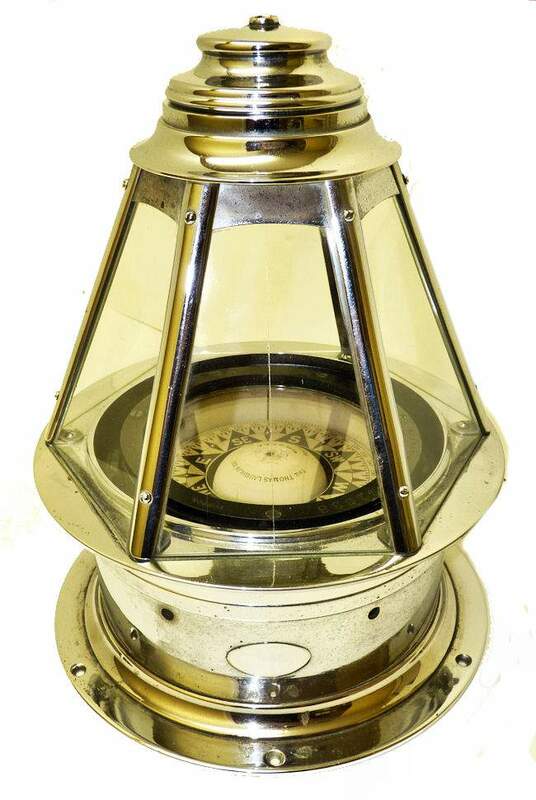 Founded as Perkins Marine Lamp in the late 1800's, the original product line consisted of hand formed and soldered navigation lights, ventilators and chart cases fabricated from brass, copper and galvanized steel. One hundred more years later, they still produce a variety of similar products and have expanded into a variety of other modern manufacturing processes and materials. In 1961 operations were moved to Miami, FL where they are now based in a 425,000 square foot manufacturing plant with a greatly expanded line of products. International buyers welcome, but should inquire first. We have satisfied customers in Argentina, Australia, Austria, Belgium, Bermuda, British Virgin Islands, Canada, Chile, China, Czech Republic, Democratic Republic of Congo, Denmark, Estonia, England, France, Germany, Greece, Holland, Hong Kong, Hungary, Iceland, Indonesia, Ireland, Israel, Italy, Japan, Kuwait, Latvia, Luxembourg, Malaysia, Martinique, Mexico, New Zealand, Nigeria, Norway, Nova Scotia, Panama, Poland, Portugal, Puerto Rico, Romania, Saudi Arabia, Scotland, Singapore, Spain, St. Maarten, Sweden, Switzerland, Thailand, Turkey, United Arab Emirates, USVI and the Eastern Caribbean. PRESENTED is a wonderful old Perko skylight or cathedral binnacle made by Perkins Marine Hardware around 1940 in the referred brass finish. It is fitted with a Star of Boston compass, serial number 4610, which is viewed through any one of seven panels. Two of the panels have etched vertical lines whose purpose is to allow for taking bearings. Engraved on its back is PAA 909. It is shown on an optional vintage wood base. Binnacles such as these became very popular statring in the 1920's. Their popularity may have increased after one was seen aboard the motor vessel "Santana" in the movie "Key Largo" (1948) staring Humphrey Bogart and Lauren Bacall. Bogie also had one in the cockpit of his famous yawl Santana. Here it is shown covered with a chrome hood. And for those interested, I insisted on having one on our ketch Bagheera which served us well during seven years of ocean cruising. PERKO discontinued making them about 1954, and Ritchie did the same. The only source today is from Danforth at $3400.00 in chrome. CONDITION: After all these years, the condition is exceptional, and everything is in "like new" condition. The binnacle has just been polished and lacquered for your enjoyment. Diameter of compass card 5" Diameter of compass 5 3/4" & Base 7 3/8"